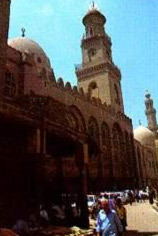 The madrasa and mausoleum of al-Nasir Muhammad was built by one of Sultan Qala'un's five sons, al-Nasir Muhammad, who ruled Egypt at various times between 1293 and 1340. This was the high point of Mamluk culture and art. This complex, built in 1295, has the first cruciform designed medersa in Cairo, but the complex is similar overall to his father's nearby complex. The Gothic style entrance was pillaged from a 13th century church of St John of Acre during the crusades, and may likely be the finest example of this style in the world. While little remains of the building itself, the four liwans are used, one each, for the four schools of Sunni jurisprudence. The minaret was probably built at the same time and using the same workmen who restored the Qala'un complex, reflecting a similar style.